Humans don’t come equipped with the plumage that some bird species use to intimidate their competition and foes. Instead they must accessorize. 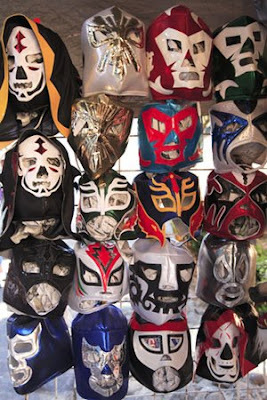 The masks worn by Mexico’s professional wrestlers are the icon of the sport and its participants. Lucha Libre (free fighting) is also part theater and part acrobatics with its own kingdom of stars that take on superhero personas. It draws large audiences to the arenas where the masked men compete. To be unmasked by your opponent is the ultimate defeat. You’ll find the masks in markets where crafts are sold. Most are made of leather. The masks pictured are handmade and lace up in the back. Don’t they have a serial killer sensibility about them? I like masks of Venice more. These are a bit scary. It's my understanding that it is a very popular sport throughout Mexico. Hi Cuckoo-They are scary. Very Silence of the Lambs. why can't you have them on your walls? I want one of those!!!!!!! I've always been fascinated by these masks in art as well. Anne, Love much of Mexico's art.